Mediterranean semi-arid landscapes are currently experiencing accelerated land use changes which are affecting species distributions. An important fraction of the European short-toed eagle (Circaetus gallicus) population, a specialised snake predator, breeds in this kind of landscapes. Information on the habitat characteristics that may affect the occurrence of this species is of paramount importance to try to evaluate how this species could be affected by ongoing territory changes. 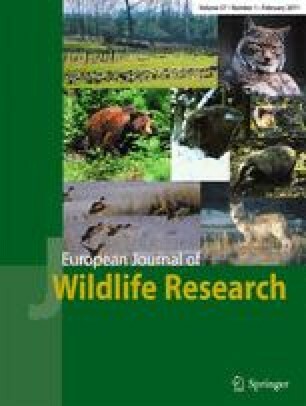 In this study, we use hierarchical partitioning analysis to identify environmental variables (natural vegetation, agricultural uses, hydrological web, topography, human pressure and climate) at two resolution scales (1 and 4 km2) that may influence the presence of the short-toed eagle in a populated Mediterranean region in southeastern Spain. Results were highly consistent between scales. Forest was the most important variable determining the presence of the short-toed eagle in the study area, showing a positive effect, particularly those inland forests with nearby presence of sunny open scrublands where the species may find its prey. On the contrary, herbaceous crops and all variables related to human pressure, including urbanisations, dispersed houses and roads, are negatively affecting the occurrence of the species. These variables are strongly related to the main driving forces that change landscapes in our study area, including the abandonment of traditional territory uses and the expansion of urbanised areas. These results indicate that the increasing number of housing developments projected in inland areas would have a detrimental effect on the short-toed eagle, especially if they are located close to pine forests and rivers. We are grateful with all the people that have collaborated in the censuses for the Atlas of Breeding Birds from Alicante Province. Thanks are also due to the personnel of Centro de Recuperación de Fauna Salvaje de Santa Faz, Conselleria de Medio Ambiente, Agua, Urbanismo y Vivienda, Generalitat Valenciana, especially to Alejandro Izquierdo and Pedro Mateo who provided additional data on short toed eagle distribution and some information on environmental variables. We wish to thank also to Joaquín Martín and Eduardo Seva (Universidad de Alicante) who helped in the elaboration on the environmental database. The English was revised by N.C. Marchant, P. O’Conell, E. Kluen and P. Karell. Finally, we wish to thank two anonymous referees whose comments improved a previous version of the manuscript. This work is a contribution to the project REN2002-03395 founded by the Spanish Ministry of Education and Science. This paper is part of DP’s PhD thesis at the University of Alicante.